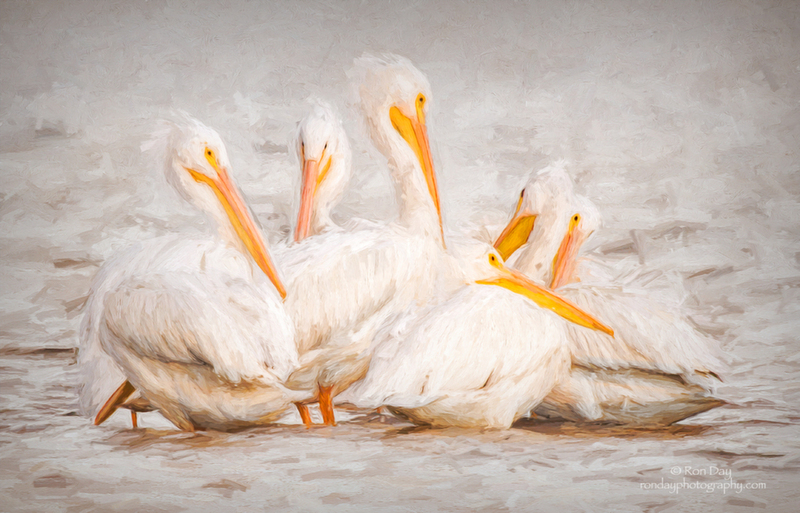 I processed my photograph of these pelicans with Topaz Impression II and Topaz Textures II. How many pelicans do you see? Nikon FX, Nikkor 500mm + 1.7X, f/8 @ 1/500, ISO 800, Gitzo Tripod, Wimberley II Head, Boat Blind. Please click on image to view it full. size. Thank you. Wonderful presentation Ron, the textures are well chosen and as for the count, I see 7 beaks. Ron, the textures and renderings you have created, resembles for me, Monet's woman with a parasol-type painting. The Pelican grouping is quite pleasing and they look very relaxed. Love the delicious creamy white feather textures (looks edible ) and the long gold beaks create a nice strong contrast to the more neutral colors. Very much enjoyed! What an entertaining bunch! Just love the textures you used here- so feathery/fluffy, and so congruous with the background. The contrasting orange beaks top it all off. I gotta wonder what they are doing, which is part of the fun of the picture- they look like they are in a tangle! Lynn, thank you. I was shooting for an impressionistic style, so any similarity to Monet’s Woman with Parasol is wonderful. Your ability to sense the pelicans were relaxed says a lot about your skills as an avian photographer. And the decision to color the beaks was, as you note, to add contrast to the scene. So your input is right on and very much appreciated. Thank you, Cindy. Glad you like the colored beaks. The image was made just after sunset, so I think the pelicans were preparing to roost. The texture for the feathers was achieved with multiple tweaks in Topaz Impression. Your comments and input are greatly appreciated. This is a wonderful addition to your collection of Pelican artworks, Ron! You have a real empathy with these enigmatic subjects and your chosen technique is absolutely perfect for these fascinating birds. If I wore a hat, I would take it off to you! Carol, thank you. I'm so pleased you liked the technique and the image. I always look forward to your very insightful comments – they are greatly appreciated. this is just outrageously brilliant and enjoyable Ron. A perfect compliment to an already divine series. Thanks for these beauties Ron. You chose a perfect image for doing an impressionistic rendering. Looks great. Big congratulations on your EP, Ron-very much deserved!! Dave and Paul, thank you very much for the kind words. Your input is greatly appreciated. Thank you, Cindy and NatureScapes for the EP. It is an honor, and greatly appreciated. Class work done here , Congratulation Sir.